Salvatore Patti, 63, died Sunday dec. 30 (2001), in the Methodist Hospital Division, Thomas Jefferson University Hospital in Philadelphia. He was principal of Andover Morris Elementary School for the Phillipsburg School District until 1998. Born June 29, 1938, in Easton, he was a son of the late Nicholas and Angelina LaGanga Patti. He was a member of St. Anthony of Padua Catholic Church in Easton where he was a member of the St. Anthony's Holy Name Golf League. He was a member of the New Jersey Education Association and the National Education Association. 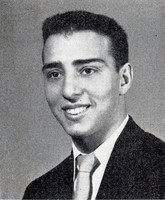 He was a 1956 graduate of Easton High School, recieved a bachelor of science degree in 1960 from East Stroudsburg College and recieved a master's degree in 1971 from Trenton State College. He and his wife, the former Kathleen A. Snyder, observed their 39th wedding anniversary June 23. In addition to his wife, he is survived by a son Michael J. of Palmer Township; and a sister, Sandra Denith of Plainfield Township. Services will be held at 9 a.m. Thursday from the Morello Funeral Home, 12th and Lehigh streets, Easton. A Mass of Christion Burial will be celebrated at 9:30 a.m. Thursday in the church, Ninth and Lehigh streets, Easton. Call 7 to 9 p.m. Wednesday in the funeral home. Burial will be in Gethsemane Cwmetery in Palmer Township.